It’s been a long time coming but Oppo finally announced the phones it’s been teasing us about for weeks. Funnily enough, the phone it kept quiet about is almost more interesting than the N3, it’s follow on to last year’s Oppo N1. The Oppo R5’s spec sheet reads like any other mid-range flagship phone at first glance: an octacore Snapdragon 615 SoC, a 5.2-inch Full HD AMOLED display, and 2GB of RAM. There’s also a 13MP camera on the back, a 5MP camera up front, 16GB of storage, and a 2,000 mAh battery that supports quick charging (it can apparently go to 75% in just half an hour). It runs Android 4.4 with Oppo’s own custom UI on top. However, it’s the device’s dimensions that really put it on the map. At just 4.85 mm thick, it’s roughly the same thickness as three Canadian quarters stacked on top of one another. It’s also the thinnest smartphone in the world, a title that was previously held by Gionee’s Elife S5.1, which was shown off at Mobile World Congress in Barcelona earlier this year. To put it in perspective, the Xperia Z3 has the same sized 5.1-inch display and measures 7.3 mm thick. The 5.2-inch Moto X is 9.9 mm thick. Like we said, the above specs are more than enough for anyone happy with a mid-range phone, and certain compromises that have been made to obtain the title of ‘thinnest’ are easily overlooked (no microSD expansion for storage, just 16GB integrated, the battery could be bigger). However, Engadget points out that the phone also has no headphone jack, which could be a major sticking point for many. If you do want to stream music on this device (you won’t be storing much once you’ve got six months of photos and all your favourite apps on there), you have to connect a MicroUSB adapter (included in the box), or connect via Bluetooth. Not exactly ideal. Sure does look good, though. 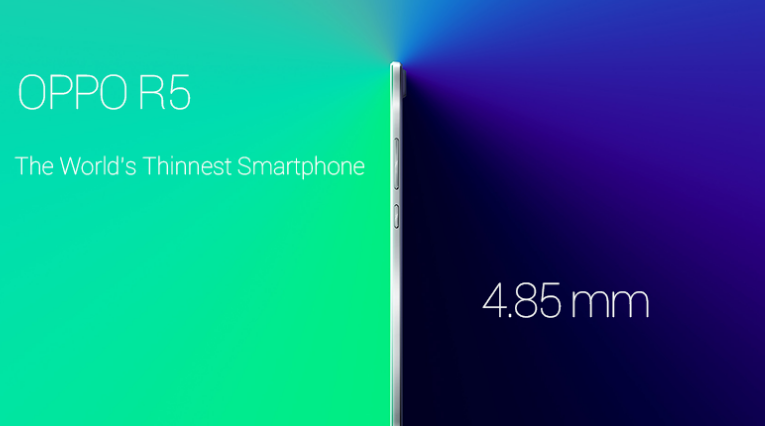 You can worry about all of these problems freely, because the Oppo R5 will enjoy a global launch in December. Pricing has yet to be announced.